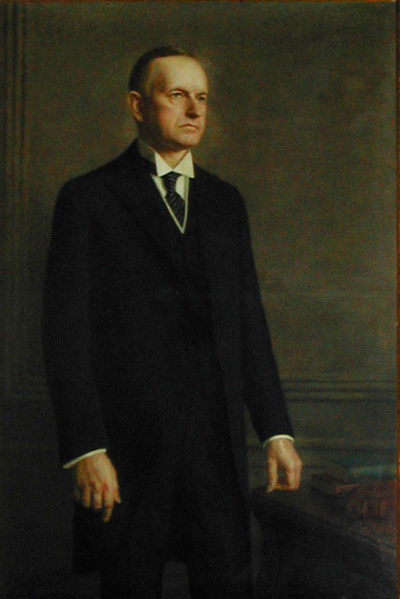 Where is the only full size portrait of Calvin Coolidge painted during his presidency? At Phi Gamma Delta's Headquarters. The Xi Graduate Chapter originally commissioned this for the Phi Gamma Delta Club in New York City. Ercole Cartotto's painting was dedicated on February 20, 1929, in the Club library. It is "life size." 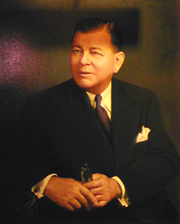 Joseph Burgess (Syracuse 1914) later made a copy for display at the Fraternity's Washington D.C. Headquarters. 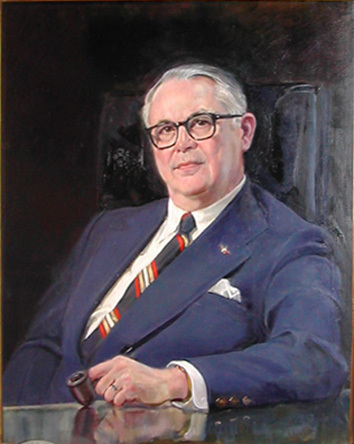 After the sale of the New York Club in 1965, the Fraternity donated the copy to the Smithsonian's National Portrait Gallery. Governor of Indiana, Vice President of the United States, and a noted wit, Thomas Marshall was also a loyal brother. Marshall served as Woodrow Wilson's vice-president from 1913 to 1921. This large painting, almost four feet tall, adorns the Headquarters library. It was commissioned in 1932 by Antonie P. "Tony" Voislawsky (NYU 1894) and John P. "Jack" Devaney (Minnesota 1905) for the Headquarters, then in Washington D.C. The artist copied a photograph that Marshall himself regarded as his favorite. James Farrell (CCNY 1907), a former field secretary, served as Executive Secretary for a year until retiring in December 1921. Later that year, the editor of The Phi Gamma Delta magazine, Cecil J. "Scoop" Wilkinson (Ohio Wesleyan 1917), started as "office manager" for the Archon Secretary in Washington D.C.
Scoop officially received the Executive Secretary title in 1926. In all, he led the Headquarters and edited The Phi Gamma Delta through four decades. Bill Zerman succeeded Scoop Wilkinson as Phi Gamma Delta's Executive Director and Editor. He served from 1959 to 1986. 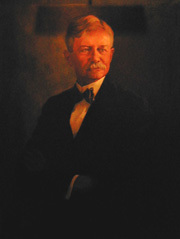 His previous positions included Field Secretary and dean of men at Ohio Wesleyan. Like Wilkinson, Zerman received the National Interfraternity Conference's Silver Medal, among numerous other honors and awards. Both executive director portraits hang in the library.